We have run a handful of blog posts WordPress over the past year covering topics such as top plug-ins and interviews with those who work within the burgeoning WordPress economy. One of the patterns we have seen has been the increasing use of WordPress as much more than just a blog and even beyond just a simple CMS. The sites below are great examples of how WordPress can be used imaginatively to create something new and original. Describing itself as “Digg for WordPress fanatics” users can submit WordPress related sites and content for people to vote up, much like Digg. shopping experience. Pick the icon you want, click and hold the image and drag it in to the basket to the left. Don’t want it anymore? Just click on the cross to remove it. Wpshift.com has brought drop and drag features you would normally associate with a WYSIWYG site builder allowing users to create their own unique layout. If I hadn’t checked out the page source I wouldn’t have believed this is powered by WordPress. This is a great example of how the back end and be integrated in to a fully functioning CMS. The Wall Street Journal shows how WordPress is ideal for magazine style websites looking to upload regular content. Bold and glossy implementation of WordPress from a hairdressing salon in Lancashire. Very stylish portfolio site with a subtle, but addictive, animated background (try scrolling up and down). 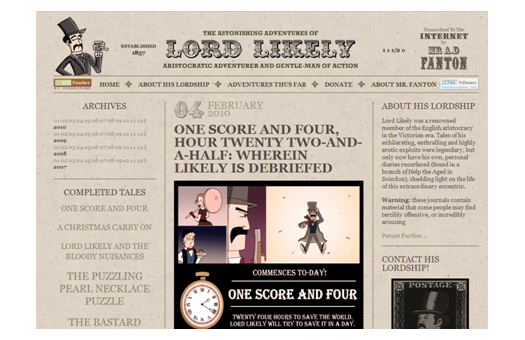 This is one of the most charming websites I have seen for some time. The subject and writing style is heavily influenced by the Flashman novels but as an example of the flexibility of WordPress it is worth taking a look. Another website you wouldn’t think of as using WordPress on face value. Very slick animation, clear messaging and simple (but original) navigation abound. Fast becoming a key channel for the music industry due to its massive user growth over the past 12 months, spotify’s entire site, from pre-sales to order process, has been built around WordPress. Doyou know of any WordPress powered websites that should have been included here, or do you own one? Let us know in the comments below so we can take a look! Thank you for including nocturn.ro as an example in your post and for the nice words about us in this interesting article. Best regards from Bucharest. Not quite as good a those above but I have developed my holiday accommodation site using WorldPress. I have found it very useful for developing a multi-lingual site. As a reseller, the one click install of WP is great and we use it as the defacto starting point for our websites these days. It is so easy to customise and we normally start with the WP Framwork template (https://wpframework.com/) which is essentially a blank them to skin as you please. Good for SEO if built right, easy for a client to amend and best of all…free as a bird! The humans also have a number of their own sites https://www.thesportsphysio.com, https://www.policemans-foot.com https://www.heritageandhistory.comand https://www.naturearoundme.com amongst many others. All made using WordPress, Heartinternet and a lot of work. Wow! Some very cool WordPress looks there – inspirational for a hack blog builder like me! Hats off to Steve McGrath for this very useful wpframework reference. I love seeing what others have done with WP.Just goes to show the amazing flexibility of WP. Good article, I wish I had the desire to write…. I love the ability it gives me to develop a site without knowing a line of code and to be able to share content with ease. There is one more. An RSS Feed Reader based on wordpress at https://www.my.infonary.com. It not only lets you follow your favourite Rss feeds but news from any topic. It also offers a RSS Mixer which lets you follow everything on your page with a single RSS feed. Were all of the WordPress examples above created for free? Anotherwords, is it possible to learn how to design such sites using only WordPress’s free tools? I salute you all. I’m a physics graduate and professional copywriter. I find the explanations of how to use WordPress (for anything) to be some of the worst I’ve ever seen. To date, I’ve wasted about 6 hours just trying to get a photograph and some text in the right place. Mind you, in terms of poor writing, facebook is even further down the food chain than WordPress. Still, millions and millions of people have learned how to use Zuckermann’s garbage software – so who am I to criticise. Nice to see the share price going down though. Actually, I really would like to use WordPress – can anyone recommend some instructions that are easy to follow? Don’t forget, WordPress is a CMS, its not WYSIWYG website building software. If you want to make edits outside of the template you’ll need some HTML/ CSS knowledge. Ian was Heart Internet's Lead Creative Designer, laying down the foundation for our design, style, and branding.